The supermarket chain wished to begin preparing for GDPR compliance by “taking stock” of their data holdings. However, it held significant data stored across various sources; from legacy systems to cloud storage. This meant that not only was data hard to locate, it was at risk of being misfiled and inappropriately classified. 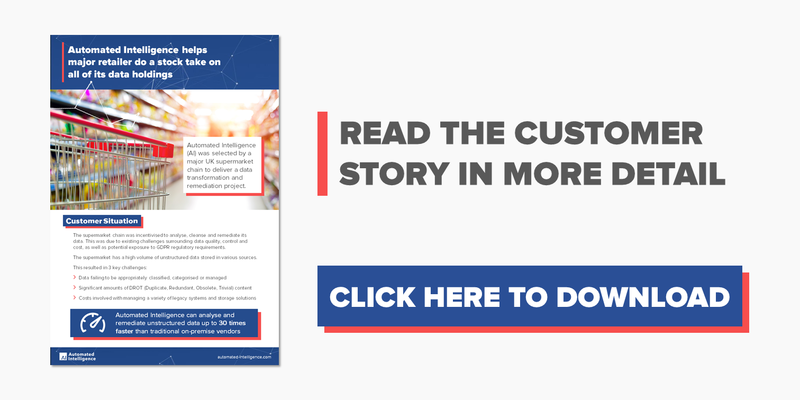 Our data management software: AI.DATALIFT enabled the Supermarket Chain to fully understand its data estate, understand what data it no longer needed and apply the most up to date data classifications. Setting them on the road towards full GDPR compliance.